Stonebrook Court is situated 21 miles south of San Francisco in the Los Altos Hills. Originally built in 1914 this house has been totally restored in the last seven years. 30,000 sq. ft. 7.5 acres garden. The opulent interior includes formal living room with Italian style 12 foot wood ceilings, an antique carved marble fireplace, a ballroom with 16th Century gilded Venetian ceiling paintings said to be from the Palazzo Grimani, a grand oak entry stair hall with plaster ceilings, library with mahogany bookcases and a secret room with wet bar and beer taps, inlaid wood floors, gourmet kitchen with mahogany island and onyx counters, breakfast room with new Gothic arch windows, complete with 7 bedrooms, 7 baths, a spacious gym, a garden building, a caretaker's house, and a 3 car garage.The six-year restoration was undertaken with great care and a commitment to a world-class outcome that would preserve the priceless artwork and craftsmanship. The estate and mansion were transformed into a warm, welcoming and grand mansion that both honors the past splendor and modern luxury. The home was wired for state-of-the-art security, audio, phone, internet and all other modern features including a heating system covering 16 zones. Architect Richard Beard drew the master plan for the restoration. Utmost attention was paid to preserving the beauty and grandeur of the estate. Materials were imported from all over the world. Stones from India, France, Pakistan, fabric and upholstered furniture from England, carved statuary from Italy, a majestic iron front gate from a plantation in Georgia, plants and trees from all over the western United States. 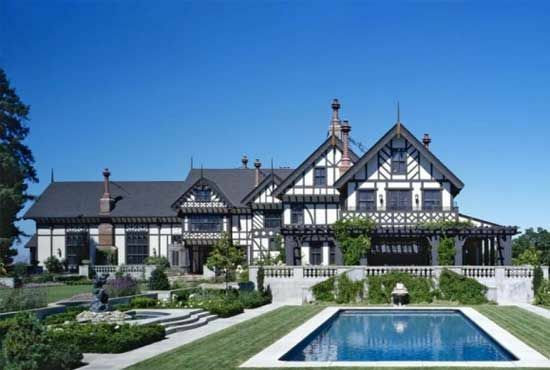 This historical landmark estate is truly a one of kind property rarely available in California.World renowned landscape architect Stephen Suzman designed the majestic garden which includes follies, rolling lawns, a focal point of a grassy Tudor mound, knot garden, boxwood parterres and long perennial borders filled with roses. The sparkling pool features a stone fountain/spa surmounted by an antique bronze statue of Neptune. The private and serene grounds of 7.5 acres provides gracious outdoor entertaining and relaxation for the entire family and guests. Views of San Francisco Bay can be seen from most of the rooms.